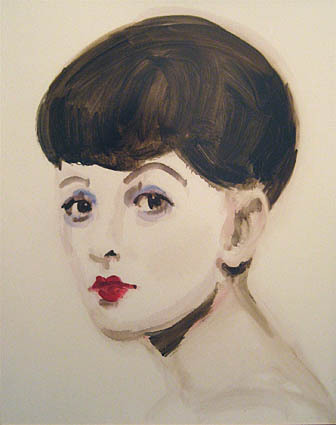 This painting is part of a series called 'Vamps & Innocents', which depicts film starlets from the silent films era in Hollywood. Actors tended to be put into one of two categories: Vamps or Innocents (the virgin/whore syndrome) and repeatedly played the same part so as not to confuse the audiences who in those days found it very difficult to separate the actors from the roles they played. Amalia was a Vamp. She was born in Hungary, the daughter of a former Countess, she became a Vaudeville performer, moved to Berlin where she became the lead dancer in the Berlin Winter Garden and a silent film star. She then moved to Hollywood and had some success as a vamp in many silent films. After an incident where she fell / jumped from a window it was reported that she had attempted suicide. She died aged 32 from complications brought on from choking on a chicken bone.